Back from a 2-day trip to Kaida-Kogen in Nagano prefecture. The event was incredibly fun, and I got to meet wonderful people. Fishing was pretty difficult. I scored a few on Saturday, but got skunked yesterday. I had many drifts where I really expected a fish but nothing bit. I finally had a very nice rise at the end of the day, after Dr. Ishigaki and I had fished 3 other streams in the last couple of hours, and were at the end of our final 200 meter stretch with no bites of any kind. I got my fly to hang in one small spot long enough to get the interest of a fish, but I didn’t hook it. The best thing about fishing frequently with someone who is a lot more experienced than you, is the confidence it gives you. 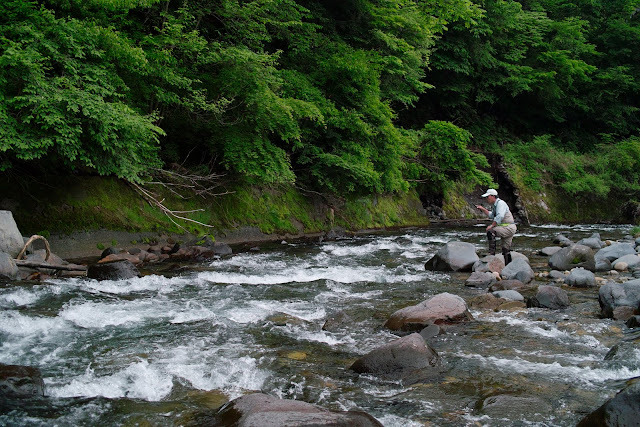 Dr. Ishigaki likes to move quickly, so we’ll fish a stretch of a stream pretty fast and if nothing is happening we get on the car and check out a different section or different stream, as water temps or other factors may be different. But, there are days when it’s just not you, nor your technique, nor your flies, it’s just that the fish are not up to eating and there is not much that can be done about it.As has often been said, if it were much easier we wouldn’t call it “fishing”, we’d call it “catching”. Moss-covered walls like these seem to be a constant presence on many streams. Walls have been built to prevent erosion of stream banks, since the water can get pretty high during heavy rains. The inn we stayed in was pretty cool, a definite angler’s hangout. It’s called Mt. Ontake and run by Kazumitsu Suzuki and his wife. Here’s the URL for reference: http://www.mtontake.jp/. They served an awesome dinner and breakfast and at a very reasonable price. The spot is a regular destination for employees of the Patagonia store, which is how they got connected with Dr. Ishigaki. Last year he gave them a class on tenkara, and we’ll be there again this coming weekend to show them tenkara. 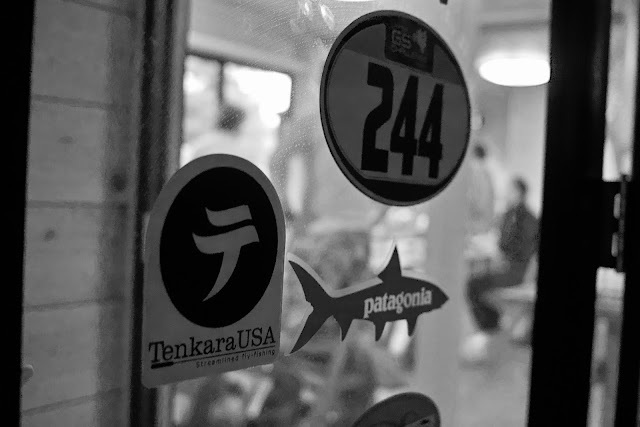 It’s incredibly interesting how tenkara, Tenkara USA and the Patagonia company keep getting connected. Suzuki-san and I got along great. He doesn’t speak English, but we were able to converse quite well about cameras, tenkara fishing, skiing and climbing Mt. 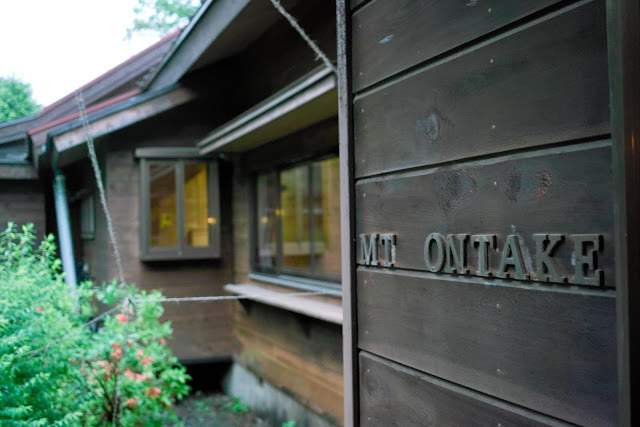 Ontake, a trip we hope to do together next year. He even told me of a “secret” spot in Mt. Ontake area where he recently found several large Iwana but no one fishing as it’s a bit difficult to access. I may even be able to visit it before I leave. Yesterday as the class took place, Suzuki-san took me around to fish in a couple of spots in the area. 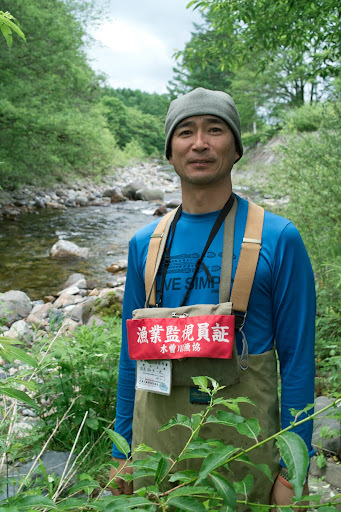 Suzuki-san is also a patrol for the streams in his area is responsible for checking anglers’ licenses. As he drove me around we stopped a couple of anglers. One didn’t have a license, but he readily pulled money to pay for it. Licenses typically cost about 1,000yen for a day ($12), and there is a penalty of 800yen if you’re caught without a license. Most people buy the license ahead of time, but it is a bit inconvenient to find the location to purchase one, so I don’t blame them for taking the chances without one. What is Dr. Ishigaki wearing from knee to feet in this picture. Looks like a nice way to protect knees and shins from pounding off rocks. Wonder if they sell something like that in USA? It is a shin/knee guard. I think I have seen it before in the US, but not very commonly. Indeed it does look like a good accessory, especially if you move around as much as he does. My shins have quite a few bruises by now. Interesting about the shin guards. Are they just neoprene? You might have seen it with me. I wear it when I fish in rocky moutain streams. It helps me to craft the rivers, especially during the World Fly Fishing Championship. I lost the one made in Japan. Now I wear the one which is made for bicycling. Also I saw a similar one for baseball catcher. 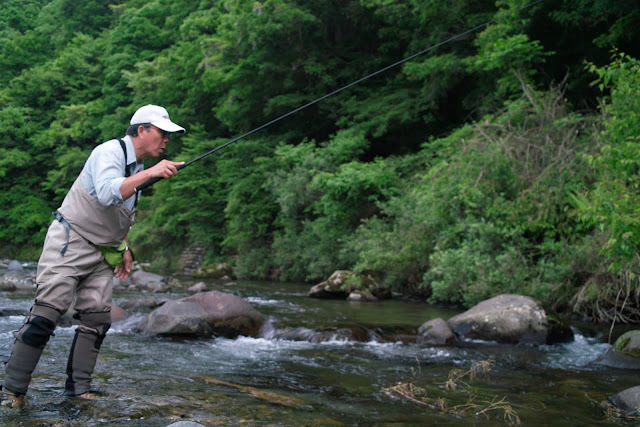 It is nice to see the pictures of Dr. Ishigaki, you and all Japanese tenkara fishers.